The front page (A1) story was about the chaos surrounding the identification of the dead at the Rana Plaza factory building in Savar, Bangladesh. Then there was a page B1 story by Ian Urbina, "Unions Seek to Revise Bangladesh Trade Status". Finally, a page B6 story by Steve Greenhouse, "U.S. Retailers Announce New Factory Safety Plan". The front-page story shows the shortcomings of the Bangladeshi government in dealing with the aftermath of the collapse, and helps explain why it happened, why laws relating to building construction, for example, were not enforced. This is not news to those who have some familiarity with the country, but is well worth highlighting to provide background to the public on where the problems and solutions lie in that country. The second story is about labor advocates' urging the U.S. Government to revoke the special trade status granted to Bangladesh, which makes possible the export of $4.5 billion of apparel and other goods to the United States. The groups cited in the story are the International Labor Rights Forum and the A.F.L.-C.I.O. The garment sector accounts for 70 percent of Bangladeshi exports and is the primary reason for its rapid growth in recent years. The industry employs four million workers out of a population of 150 million. Bangladesh has the highest population density in the world other than a city-state like Hong Kong. A measure of Bangladesh's devastation by illness, natural disaster and accidents is the fact that only 4 percent of its population is over 65 - compared with 13 percent in the United States. The 9 percentage-point differential amounts to a missing elderly population of nearly 14 million people. Labor advocates want to punish the Bangladeshi government for not enforcing labor laws better to protect the 4 million garment workers. U.S. Government officials argue, properly, that taking away the trade status removes its leverage over the Bangladeshi government as well as creating the likelihood of another failed state in a region of the world where that would create global security issues. 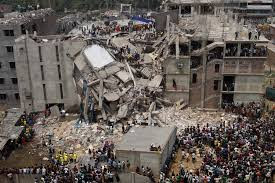 The third story by Steven Greenhouse was about the Bipartisan Policy Center's new involvement in the generating solutions to the lack of enforcement of Bangladeshi factory safety laws. The Washington-based Center will administer a new agreement between Wal-Mart, Gap, several other brands (Sears, JCPenney, and Target) and at least four industry organizations - the National Retail Federation, the American Apparel and Footwear Association, the Retail Industry Leaders Association and the Retail Council of Canada. In terms of the potential for creating change, this story deserves better placement than it got. The initiative was immediately attacked as a "sham" by the Uni Global union and as lacking "real obligation" on the part of the brands by a labor advocacy group. However, the fact that the development and implementation of the agreement will be led by former Senators George J. Mitchell and Olympia J. Snowe deserved a more positive response. Both senators are from Maine; one is a Democrat, the other a Republican. Both are well-known and well-regarded for their diplomatic skills. The new agreement parallels the Accord, which was pioneered by international unions and advocacy groups and after two years with little support is now supported by mostly European brands. The Ruggie Guiding Principles on Business and Human Rights (see John Gerard Ruggie, Just Business, Norton, 2013) put the responsibility for worker and workplace safety primarily on government. Unsafe buildings should not be permitted to be built or to remain open after they are found to be unsafe. Corrupt inspectors should have their licenses removed and prosecuted. This is how things work in New York City, and this is how they should work everywhere. What campaigners are arguing is that the brands are responsible. What the brands have to do is act together to pressure governments in developing countries to enforce the laws they pass about worker safety. That gets us to implementation and that gets us to NGOs and to trust. NGOs (non-governmental organizations) are by definition neither governments nor businesses. The term NGO is used in the global context – within the United States the more common term is nonprofit. (1)Supporters of Local Development. The groups closest to the ground are NGOs that collect funds for a variety of development projects in different areas, and provide financial and technical support to smaller local NGOs. These groups often partner with global groups on implementation of programs. (2)Nation- or Region-Focused. The second group is made up of nation- or region-specific NGOs. These regional NGOs may restrict their activities to the specific areas, conflicts or issues. (3)Global. The third group consists of international bodies such as Amnesty and Human Rights Watch, whose operations are global. Companies, campaigners, labor unions and government concerned with world-wide operations will find that global NGOs are efficient stakeholder allies. The local and regional/national NGOs tend to work together with global NGOs. The largest global NGOs in New York City are UNICEF, the International Rescue Committee, and the Institute for International Education. Industry-oriented groups, representing the jewelry business, retailers or manufacturers. These are the primary NGOs initially recruited for the Bipartisan Policy Center initiative. Campaigners, representing those outraged by an event or doggedly pursuing an objective such as freeing political prisoners – for example, No Dirty Gold, Clean Clothes Campaign, union-based groups, the Interfaith Center for Corporate Responsibility, Transparency International, or the Maquila Solidarity Center. These groups may be driven by events or new information and understandably tend to attack the most recognizable brands regardless whether or not the brands were involved in the disaster or disgrace, or were leading the effort to find a solution. Brands that have been “bitten” by activists try to rebuild their reputation based on performance. They will seek to engage either with campaigners or with implementing NGOs, or both. Implementing groups, including training groups, and certification and accreditation bodies. These groups are focused on quietly seeking to improve conditions and generally seek to include activists, unions and industries among their stakeholders. Some are truly multi-stakeholder. Some have key representation missing, either because they didn't try to spread their net more widely in the first place or because polarization on an issue becomes so extreme that some groups do not want to cooperate with them. Examples: CERES, Fair Labor Association, ISEAL Alliance, SA 8000/Social Accountability International. The biggest challenge for both the union-led Accord and the Bipartisan Policy Center group will be to line up governmental allies. The Accord group is planning on involving the ILO. Given the composition of its members, the group administered by the Bipartisan Policy Center is more likely to focus - at least initially - on the U.S. Government. UK, cell-phone theft is rising. The remedy is now the target. The Institute for Economics and Peace recently put out the UK Peace Index, which got me thinking about crime rates. Five days before, the London Economist included an article, “Down These Not So Mean Streets” (April 20), showing the steady decline of British crime rates over two decades, to half its earlier levels,. despite a continuing serious recession. The same week, the British Crime Survey (a household survey comparable to the U.S. Victimization Survey - a supplement to the Uniform Crime Report) also reported a continuing drop in crimes. There has been a steady decline from the 19 million estimated in the mid-1990s to 8.9 million crimes – the same 50 percent drop that the Economist cited from police reports, although the police recorded only 3.7 million crimes. Compared with 2011, crimes fell as much as 15 percent in the UK for the category of criminal damage. Robbery (stealing with the threat of violence) was also down more than 10 percent. The UK Peace Index at the same time showed that the incidence of violent offences – which is higher than in the United States, although injuries and deaths from such events are much less seious – is falling faster in the UK than in other countries in Europe or in the United States. Police Deployment. The British Government claimed credit for the crime drop through better use of police, as the number of UK police deployed has fallen to the lowest level in more than ten years. Police are used more effectively than in the past, but crime rates have continued to fall, long after police methods changed. More Perps in Prison. Hard-liners in the USA and Britain argue that tougher sentencing that jails more criminals has pulled criminals off the streets and served as a deterrent others. Since the 1970s, starting with Nixon’s war on drugs, the USA built up the largest prison population in the world, to the recent level of 2.2 million, a fourfold increase in incarceration in 1978-2008. With less than 1/20th of the world’s population, the USA now has one-fourth of its prisoners. The higher incarceration rates and sentences originally targeted drug sales. But later the sum also rises for violent (murder, robbery, assault) and property crimes - and while U.S. incarceration rates have recently been declining, most crime rates continue to fall. Reduced Air Pollution. If you are a hammer, everything looks like a nail. High lead in the air has been seriously linked to teenage misbehavior, so environmentalists like Jessica Reyes argue that reduction in lead in gasoline could explain lower crime rates. This may well have been a contributory factor. But the reduction in lead has been gradual - is the impact of this likely to have been so rapid and continuous? Legalized Abortion. Stanford Law Professor John J. Donahue III and Chicago Economics Professor Steven D. Levitt in 2001 argued that legalized abortion meant that fewer children were being born to mothers who could not afford an abortion - or did not dare to get one - when it was illegal. But this event analysis could be confused with something else that is occurring at the same time. The original article is well-constructed. However, the thesis and data, disseminated in Levitt’s Freakonomics book, have been widely disputed. Critics observe that the presumed causality based on national law does not work very well with state data and changes in state laws. Missing from the FT story is another hypothesis that does a good job of explaining both the decline in general crime rates and an increase in larceny (thefts from people's person without threats, i.e., skillful pickpocketing) and certain robberies. In London, 300 cell phones are stolen every day, half of them iPhones. Men tend to robbed, i.e., have the phones taken from them by force, whereas women tend to be victims of larceny, i.e., they have their cell phones taken from them by stealth. The likely London victim is a yuppie in their 20s at a club or other "place of entertainment". In San Francisco, stealing of cell phones accounts for half of all robberies, and Bay Area Rapid Transit is a likely place for thieves to operate. In Oakland, a man came out of an anti-crime meeting at a police precinct house and was relieved of his cell phone at gunpoint. 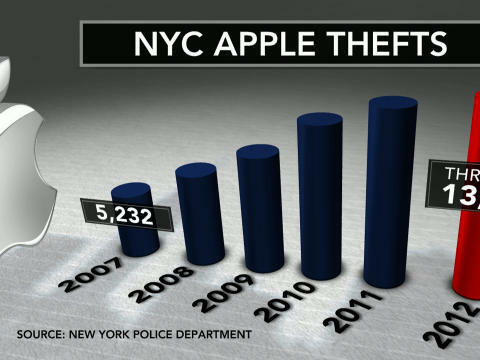 In New York City, cell phone theft now accounts for 40 percent of robberies. A young chef from MOMA on his way home was stopped and killed for his iPhone 5. In a widely reported story a few months ago, a Brooklyn cell phone thief had the stolen cell phone swiped from him by another cell phone thief. Thief #1 reported the crime to the police, providing information that allowed them to trace Thief #2. Both of them were arrested in a highly satisfying day for the NYPD. From a thief's perspective, the theft of a cell phone has the advantage of removing from the victim the means of calling the police, although in an urban environment there are many ways to get lost in a crowd. Be aware when you use the iPhone in public. In San Francisco, one M.O. is to slap the victim on the back of the head and catch the iPhone. Use the password - the iPhone can be set up with a four-digit password. Use it. Write down the ID number of the iPhone. You need to know your iPhone's International Mobile Equipment Identifier, the IMEI. The easiest way to find it is to go to the dial pad and type *#06#. Two other ways are in the article. Then record it somewhere where it can be found in a crisis - such as on your partner's iPhone. My IMEI number is 013037000631140. You can have the number recorded by your local policed station. Because of the high incidence of the crime, the NYPD is delighted to register your cell phone IMEI. Use location tracking apps. It is free on Apple products. Brick the iPhone. Call the police and your cell phone service carrier. The iPhone can be made inoperative (like a brick) even if the thief changes the SIM card, unless the iPhone is exported. Keep the 800 number for your carrier somewhere other than on the iPhone. Change passwords. Having your iPhone stolen is a pain because passwords may be stored in them. Credit cards, banks... Change the passwords. Stay one generation behind the latest iPhone. In April a woman in the San Francisco area was relieved of her cell phone at gunpoint. But the thief returned it to her because it wasn't an iPhone 5. Protect yourself by being behind the times a little. The police are becoming highly active in encouraging iPhone owners to bring the devices in to have the identification codes recorded. This will help them catch cell phone theft more quickly. The police are properly encouraging us all to be more watchful. We can also be on the alert to warn iPhone users about the frequency of iPhone theft. Police involvement in identifying cell phones makes it more likely that these thefts will be reported. The robbery/larceny rate is likely to continue to climb until there are better ways to catch the thiefs. 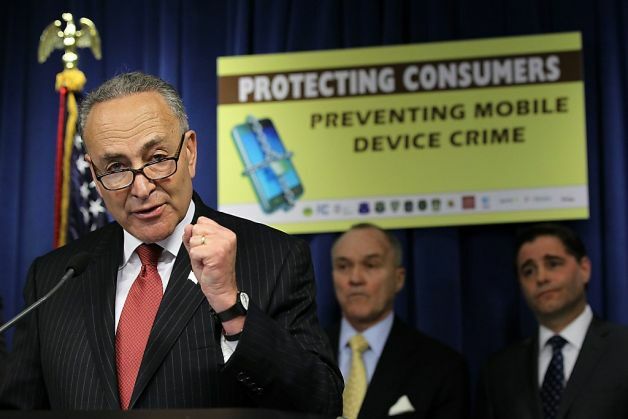 Senator Chuck Schumer (D-NY) and NYC Police Commissioner Ray Kelly have advocated a national registry of cell phone numbers. This is coming on line, but not so quickly. Meanwhile, watch out for theft, report incidents, and support programs to reduce crime. Update (April 9, 2015). Cell phones are now crime scene records. The implications of this for the police and for crime control are still being figured out.